Southerners have a great sense of humor, but we’re awfully serious about our barbeque. 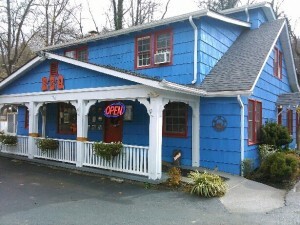 One of the best local spots to enjoy this culinary staple is Hungry Bear Barbeque, with two great locations at 2263 East Parkway and 490 East Parkway, both in Gatlinburg. Each location has its own distinct style, with plenty of bear statues, photos and paintings to pay homage to the majestic namesake. The 490 East Parkway location is a particular favorite, as it is housed in an enchanting house with a big front porch to welcome you. The owner rents the location, but stays true to integrity of the home by arranging the business around the structure. The result makes you feel as if you ’re truly coming home for a genuine Southern meal. There is ample seating, with picnic tables arranged to enjoy the beautiful weather while you dine as well as multiple dining rooms inside. The stone fireplace is cozy and welcoming for the chilly months ahead. A variety of homemade barbecue sauces on each table allow you to sample and decide what suits your taste buds best. Due to demand and high traffic, they’ve recently opened an additional dining space upstairs and are working are opening another upstairs room up to diners as well. The heady aroma of wood smoke, roasting meat and spices tickle your nose as soon as you pull into the parking lot. The scent lures you inside, almost as if tendrils of the delicious fragrance wrapped around you, pulling you in. Once inside, you’re overcome by the options on the menu. Everything looks and smells delectable, and choosing just one meal seems impossible. Often there’s a special on a sampler. Recently one included homemade sausage, ribs, pulled pork, two rolls, and two sides for only $13.95. The portions are generous (two adults and a child shared that special!) and you leave with a full stomach without breaking the bank. Make sure to get there early enough to have full menu selection; when we went later in the evening, they had run out of several more popular side dishes. Even with less selection, it’s still hard to decide! Even late in the evening there’s typically a line, which is a good indicator of a local favorite. Each meal is prepared with pride and is fresh; no cooked meat even has time to be refrigerated. It goes straight from the barbeque pit to being served to those waiting in line. Whether you choose to sit outside in the sunshine or inside surrounded by bears, you’re sure to enjoy your meal. Do you want to live in the midst of barbeque central? We have homes listed for sale in Gatlinburg, Pigeon Forge and Sevierville that will allow you to eat at Hungry Bear Barbeque as often as you wish. You can dine in or take your thoughtfully prepared meal home to your cabin. Don’t think you can afford a dream home in the mountains? Check out our distressed listings for a special bargain. Your dream may be closer than you think.